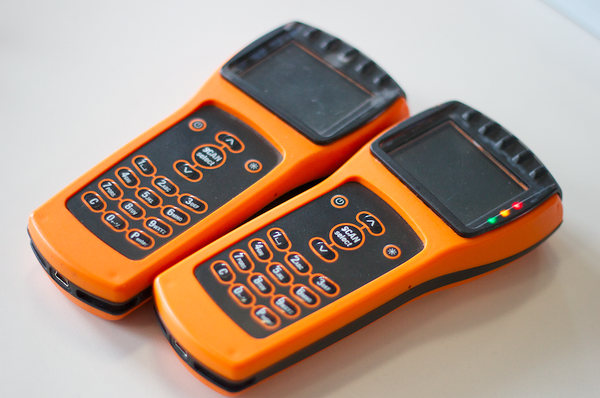 Inspector’s device is basically a portable handheld terminal. It is designed mainly for inspection purposes, but can also be used for ticket sales or validation. The terminal has an integrated contact smart-card reader, contactless RFID reader, NFC communication and 2D barcode scanner. This makes it very useful, when online system uses different type of tickets including EMV cards and paper tickets. The terminal has a local ticket database which can be updated in various ways. The 3G network is used for regular data exchange with central server. For last minute updates a USSD communication protocol is used, allowing high-speed interactive communication over a GSM network. NFC communication is used for retrieving latest ticket validations from validators on-board the transportation vehicle. The terminal also has a mini USB port which can be used either for data exchange or battery charge. The terminal can also be connected over Bluetooth to a printer. Ticket inspector can print either sales receipt when selling tickets or to issue a fine when inspecting tickets.